We've begun construction of a new launch stand that will provide better stability than our previous rod-based launcher. 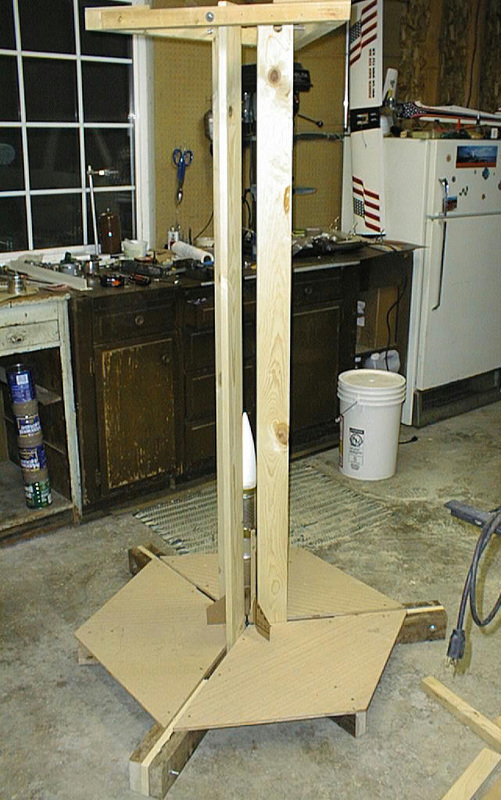 The rocket is guided by three - 1" x 4" x 6' rail boards. The rail boards are held 120° apart at their base by 2" x 4" and plywood segments. Slots in the bottom of the rail boards, and screw adjusters on the top, allow adjustment to accommodate different sized rockets. 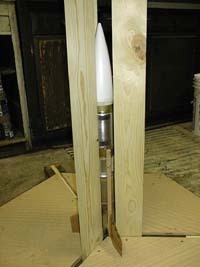 The base segments also have legs which can be adjusted to point the rocket into the wind. At the top the rail boards are supported by a triangle which allows the rocket fins to pass freely. The rocket is guided by the inside edges of the rail boards. Some care was required to assure that the edges of the board are straight and smooth. 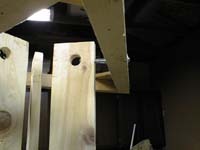 The upper ends of the rail boards are supported by 1/4-20 machine screws, and a captive nut, with a spring for tension. (click on the picture for a large-scale version) This arrangement allows for adjusting the spacing of the rail boards.